CHESTNUT HILL, Mass. 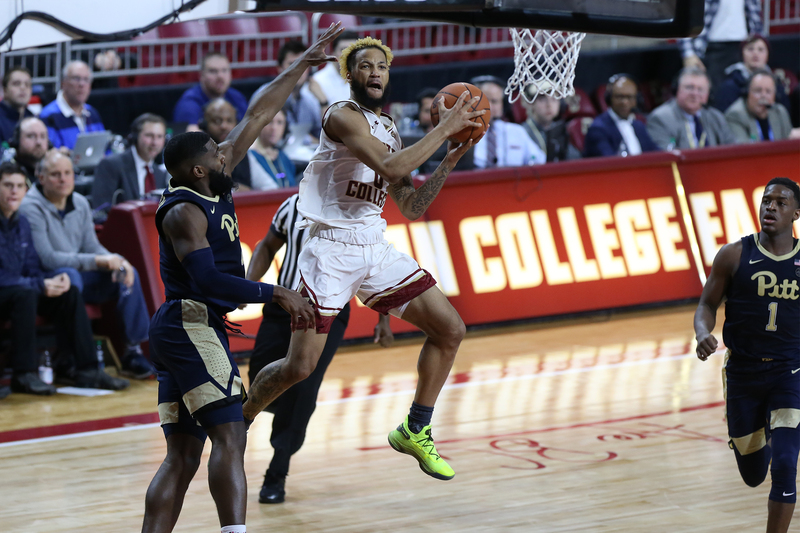 – With two starters out due to injury and losing another starter during the game, the Boston College bench came up big with 26 points as the Eagles earned a 66-57 victory over Pitt Tuesday night at Conte Forum. The win moved BC to 12-11 overall and 3-8 in the ACC while Pitt dropped to 12-13 on the season and 2-10 in conference play. The loss was Pitt’s 21st straight road defeat, including 18 consecutive ACC road losses. Boston College took a four-point lead into the break at halftime, 36-32. BC shot 50% from the field in the opening 20 minutes of play and outrebounded the Panthers, 21-16. Ky Bowman led all scorers with 10 points in the first half, including a perfect 4-of-4 from the free throw line. BC’s bench gave the Eagles a big boost as well in the first half as the group delivered 14 points. Johncarlos Reyes scored six points and grabbed six rebounds off the bench in the first half for the Eagles. BC led for over 14 minutes in the first half, with its largest lead coming at nine on two occasions. The game was tied at 51 with 8:48 remaining, but BC used a 14-3 run to pull away down the stretch. BC’s defense held Pitt to 1-of-16 shooting over the final five minutes of the game. Ky Bowman reached double-figures for an ACC leading 32nd consecutive game. He finished the night with 14 points, eight rebounds and seven assists in 40 minutes of action. Jairus Hamilton finished with 11 points, his second ACC game of the season in double-figures. Hamilton knocked down three from behind the arc, just one trey shy of his career-high of four three-pointers made at Virginia Tech (1/5/19). The rookie was 4-of-5 from the field and 3-of-3 from downtown. Jared Hamilton added eight points and three rebounds. He scored six of his eight points in the second half, including a key 3-pointer with 3:35 to go. Chris Herren Jr. added nine points, a season-best six boards, and three assists in 20 minutes of play. Four of Herren’s six rebounds came on the offensive glass. Steffon Mitchell tallied eight rebounds and five blocked shots, to go along with three points and an assist. Johncarlos Reyes (six points, eight rebounds) and Luka Kraljevic (six points, two rebounds) filled in for the injured Nik Popovic tonight in the middle. Popovic and Wynston Tabbs missed the game due to injury. In addition, Jordan Chatman suffered a laceration on his finger and was not able to return in the second half. Chatman scored nine points and had three rebounds in 22 minutes before leaving the game. Every player who saw action for the Eagles scored at least three points. Tonight’s game marked the 53rd all-time meeting between the two schools. BC is 20-33 all-time versus Pitt. BC moved to 10-14 all-time vs. Pitt at home and a 2-5 mark against the Panthers in ACC play. 29%: Boston College held Pitt to 29 percent shooting from the field (20-of-69) on the night. Five players tallied double-digits in efficiency, led by Ky Bowman’s 15. Jairus Hamilton tallied 14, while Steffon Mitchell, Chris Herren Jr., and Johncarlos Reyes each had 11. Efficiency rating is calculated using the following formula: (PTS + REB + AST + STL + BLK – Missed Shots – TO). Boston College returns to action Sunday, Feb. 17 at Conte Forum versus Miami. Tipoff is at 6 p.m. on ESPNU. The game can also be heard live on the Boston College IMG Sports Network (WEEI 850 AM) with Josh Maurer and Danya Abrams.